Dorothea MacKellar’s famous ode to Australia echoes loudly down through the generations. The harsh Australian sun has taken its toll on my fair freckled skin after a youth spent outdoors. This week I have had a basal cell carcinoma removed from my forehead. Spending my childhood and teenage years outdoors without a hat or sunscreen was normal for me and my generation. 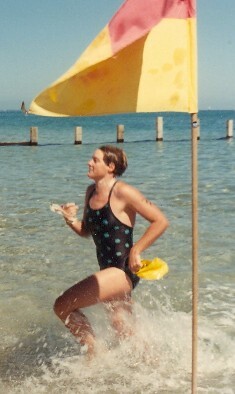 I spent most of my free daylight hours outside playing tennis, swimming, and water-skiing. Cracked lips, peeling noses, and sun burnt skulls were badges of honour as proof of sun-worship. My skin did tan to a light golden colour and to me this was some kind of validation of my Australian identity, shunning my English, Scottish and French ancestry. I inherited my skin type from my mother and aunt and they both have had many nasty things cut and burnt from their skin. My aunt who will turn 90 years of age this year has had so many cuts made to her face that she looks like she has been in a car accident. She is not the slightest bit vain about it and I admire her common-sense and practical attitude. I still enjoy an active outdoor life but nowadays I wear a hat and sunscreen. Unfortunately the damage is already done and I fear this little operation may be the first of many. The recent Web 2.0 conference resulted in some new connections with suggestions and requests for more work. With a couple of days off work I know my workload is piling up. I have lots to do. I need to report on the conference; think about writing an article for an organisation whose representative approached me after my presentation, create more wikis, find some appropriate videos for classroom projects, transfer the library content from our intranet to the new content management system, as well as my usual library work. Not to mention catching up on reading the email, blogs and twitters that will be accumulating. Just do it! A term coined by a man I’d bet. Many women who are mothers don’t have time to “just do” anything else except be a mother. Trying not to lose track of the lap count in my head, I thought about my exercise routine as I enjoyed my early morning swim. I have always tried to be active but when women have babies their bodies are not their own, and then when the babies grow into children and teenagers, the mothers time is not their own. Twenty years can disappear in the blink of an eye while all the attention for nurturing is on the children, not oneself. It feels like a luxury for me to do as I please now without having to first consider the schedules, demands and needs of others. Having said that, I miss the daily conversations and interactions with my children, that I enjoyed for all those years. So I swim, do pilates, lift weights, practice yoga, cycle and walk; all of these regularly. It feels great and I feel stronger, fitter and healthier than I have for a long time. Given the choice I would exercise before I went online. A walk outside breathing in the fresh air interests me more that surfing the net. I admire those who have a regular exercise routine and use their web time to try to inspire others to exercise by logging their efforts. Keep it up Leo.